On the occasion of the visit of Ukrainian Prime Minister Arseny Yatsenyuk to Brussels, European Commission President José Manuel Barroso warned Moscow it was against Russia’s interest to confront with the West and that it was not too late “to engage positively”. Barroso called his meeting with Yatsenyuk and his accompanying ministers “unprecendented” because it was the first time the European Commission was meeting with a foreign government that has an association agreement with the Union. The EU and Ukraine only signed the so-called “political chapters” of the association agreement during a bilateral summit on 21 March. But it postponed the signature of a related free trade agreement in an attempt to “reassure” Moscow about the consequences of the pact for the Russian economy. Brussels also wants to avoid giving too much political backing to the present government, which was hastily appointed by Parliament following the toppling of Viktor Yanukovich, and is not seen as fully representative of the country, especially the Russian-speaking east and south [read more]. The visit took place against the background of armed clashes between pro-Russian separatist militia and the Ukrainian army in the country’s east. As Yatsenyuk was visiting, separatists inflicted the heaviest loss to the Ukrainian army, killing seven military near the city of Kramatorsk. Barroso said the EU was following the situation in Ukraine with “great concern”, adding that it represented the “greatest challenge to Europe’s security since the fall of the Iron Curtain and the fall of the Berlin Wall”. Using a term from the Cold War period, Barroso said that “the doctrine of limited sovereignty should belong to history books”, adding that “history belongs to those that embrace the future, not to those who try to hijack it”. The doctrine of limited sovereignty is also called the ‘Brezhnev doctrine’ after the name of the Soviet leader who led the Warsaw pact invasion in Czechoslovakia to put an end to the Prague Spring, a period of political liberalisation in the former Czechoslovakia. The Commission President said the Union considered the so-called referendum in Ukraine’s Eastern regions as illegitimate and illegal, and that its outcome would not be recognised. On 11 May, pro-Moscow rebels declared a resounding victory in a makeshift referendum on self-rule, saying that nearly 90% had voted in favour [read more]. Barroso also said that to achieve de-escalation, the sides had to build on the diplomatic efforts agreed in the quadrilateral Geneva statement and continued by the Organisation for Security and Cooperation in Europe (OSCE). On 17 April, the United States, Russia, Ukraine and the EU adopted a declaration, urging “all sides” to refrain from any violence, intimidation or provocative actions. The OSCE plan envisages a quick launch of high-level round tables across the country bringing together national lawmakers and representatives of the central government and the regions. But Yatsenyuk said Ukraine had its own roadmap leading to a change of constitution and decentralisation, based on the concept of a roundtable including the regions, which had similarities with the OSCE plan. But he stressed that this had to be a Ukraine-led and a Ukraine-owned process. Yatsenyuk spoke in defiant terms, calling the pro-Russian separatist forces “terrorists”. Conversely, Russia called his government a “junta” and Russian propaganda keeps repeating that the new government in Kyiv is dominated by “fascists”. “Russia will fail to make Ukraine a failed state”, said Yatsenyuk. Asked by the press whether he had a message for the Russian President, Barroso was apparently happy to do so, saying he knew Putin well after meeting with him “at least 20 times” during his two terms as Commission President. His message was that Russia’s dealings in Ukraine were running counter to its long-term interests. “Russia by the way is a multinational country that also has problems of stability, and to support instability in a neighbouring country is certainly not good for the future. It’s certainly not good for Russia to have this kind of confrontation with the European Union”, he added. The EU has so far put more than sixty Russian officials, including close aides to Putin on its sanctions list, freezing their assets and banning them from travel to the Union, in response to the annexation of Crimea and the destabilisation of eastern Ukraine [read more]. A third level of sanctions, which would hit Russia’s economy and probably have consequences also on EU countries, is in preparation in case of worst-case scenario. 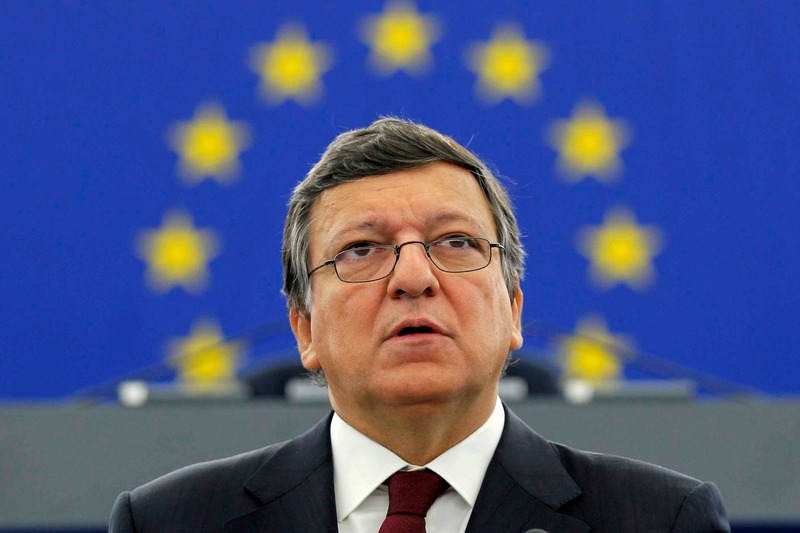 The EU is by far the most important economic partner of Russia, Barroso reminded. “If Russia continues with this kind of behaviour, it would only contribute to a further isolation of Russia in the world […] So my message to President Putin is that he should engage constructively. By that I mean de-escalate the situation, (and) work constructively with Ukraine, but also with the EU, because it’s a matter of concern for all of us in Europe, and if Russia wants its international status recognised, it is not by this kind of behaviour that it would get that recognition, on the contrary”, Barroso said. The Commission President warned about stoking “nationalistic sensitivities” in Russia, saying it would bring only buy “short term” respect from the West, adding the EU’s door remains open for Russia to “engage positively”. Barroso and Yatsenyuk also spoke about the ongoing efforts to avoid a gas crisis over a payment dispute with Moscow. Russia has said it would halt gas deliveries by 3 June, if if Kyiv does not pay in advance for deliveries [read more]. Yatseniuk urged Russia not to use natural gas as a “weapon” against his country, and accused Moscow of seizing tens of billions of dollars’ worth of its assets and energy resources in Crimea. “We are ready for a market-based approach and Russia is to stop using natural gas as another, or a new type of Russian weapon,” Yatseniuk said. Ukraine wants to change the conditions of a 2009 contract that locked Kiev into buying a set volume of gas, whether it needs it or not, at $485 per 1,000 cubic metres – the highest price paid by any client in Europe. Moscow dropped the price to $268.5 after then-President Viktor Yanukovich turned his back on a trade and association agreement with the European Union last year, but reinstated the original price after he was ousted in February. Kyiv has so far refused to pay the higher price, saying gas is being used as a political tool by Moscow to punish Ukraine’s new leaders for moving closer to the EU. Yatseniuk said Ukraine was ready to pay its arrears for Russian gas within 10 days if state-controlled Gazprom agreed to sell it at $268 per 1,000 cubic metres. But he repeated a threat to take Gazprom to an arbitration court in Stockholm if the two sides failed to agree on a price by May 28, and said he was making a “final call” to Russia to sit down and negotiate a solution to the gas dispute. Yatseniuk accused Russia of seizing Ukrainian property worth tens or even hundreds of billions of dollars, including Crimean gas company Chernomorneftegaz, when it annexed the region in March. “They have stolen more than 2 billion cubic metres of Ukrainian natural gas. They’ve stolen our fields, they have stolen our companies, they have stolen our onshore and offshore drills. We will see Russia in court too,” he said. Reportedly, a new ministerial meeting between Russia, Ukraine and the EU, involving energy commissioner Günther Oettinger will be held in Athens on 16 May. A first such meeting, held in Warsaw on 2 May, made little progress [read more]. Pro-Russian militants control buildings in more than 10 towns in eastern Ukraine after launching their uprising on 6 April. On 11 May pro-Moscow rebels declared a resounding victory in a referendum in Donetsk, which the West called illegal and illegitimate.